Description: How To Get The Specific Records From Table In Linq. Best Dot Net Training. LINQ – Language Integrated Query is a way to write queries on various data sources especially the collection of objects, SQL database, XML document. The queries syntax is very similar to SQL queries and includes similar features like sorting, filtering, grouping, joining and calculating. LINQ now is an integral part of C# language features and internals of it are depended on Extension methods and delegates topics. qry.ToList(); it will return All the Customer Records. LINQ The goal of this Linq online course is to make the developer proficient enough to use LINQ as an alternative to SQL Queries and database training courses. The online classes for Linq demonstrate how LINQ can be a better way of handling XML documents. 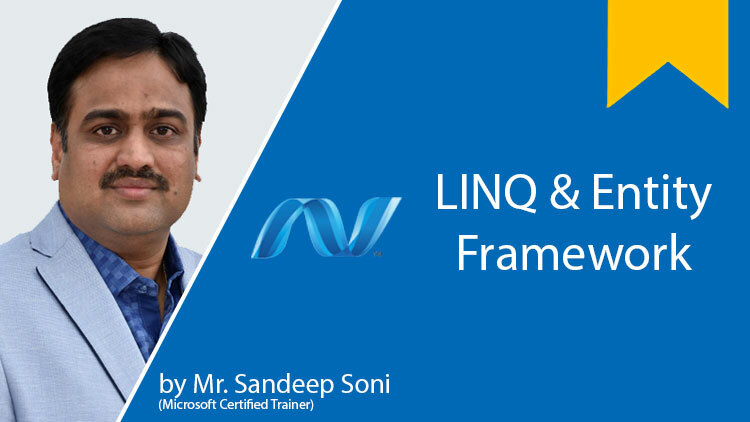 The online Linq training videos will provide a deep understanding of how to deal with Linq to objects, Linq to SQL, and Linq to XML kind of things. Our Linq to SQL tutorial provides the best Linq training covering each and every feature of Linq course. Our online Linq training videos also focus on dealing with Lambda Expressions as well. At the end of the Linq course, the student can be able to write the Linq queries and Lambda Expressions perfectly. EntityFramework ADO.NET Entity Framework is an object-relational mapping(ORM) framework for the .NET Framework. It is designed to enable developers to create data access applications by programming against a conceptual application model instead of programming directly against a relational storage schema. It eliminates the need for most of the data-access code that developers usually need to write. So in this Online Entity Framework Tutorial, you will understand how decent amount of code is been decreased and you’ll also learn how maintenance is required for data-oriented applications. This Online Entity Framework Tutorial is for developers who want an easier way to create their data access layer. You should be comfortable with ADO.NET, but it’s not mandatory to know anything about the Entity Framework. We will also work on some sample examples where you will understand and get into the real concept of Entity Framework. Working on Selectors in JQuery Tasks.Best Dot Net Training.